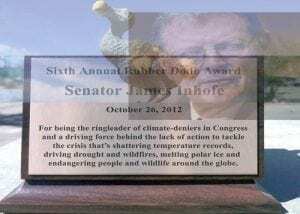 Last week the Center for Biological Diversity presented its sixth annual Rubber Dodo Award to Senator James Inhofe, joining the ranks of other “luminaries” in their ongoing effort to drive endangered species to extinction across the globe. Inhofe is in the company of such earth-spoiling role models as former Alaska governor Sarah Palin, winner of the 2008 Rubber Dodo and BP CEO Tony Hayward, who snagged the 2010 award (a clear winner for that year). This is fine company indeed if you’re someone like Senator Inhofe who still clings to his addled and hackneyed notion that climate change is hoax. And for the hapless, small-minded senator, that is high praise indeed. That’s right, that “radical environmental group” operating under the guise of biological diversity isn’t getting anything past Inhofe. He’ll proudly display his Rubber Dodo as a badge of anti-science, denialist honor – likely to his grave. What is truly tragic is that Inhofe’s confusion and willful ignorance doesn’t end with him. Long after he has left this mortal coil to join Jesus in Heaven, his deceit and obstruction on climate change will live on, with his own children and grandchildren and those of all of us. –Floods, droughts, raging wildfires, stultifying heat waves have no agenda. It is Inhofe’s refusal to see the reality before us that is radical and untenable. To label scientists as con men and anyone who dares work for a sustainable future as “far-left radicals” without any consideration for the risks he blithely ignores is unconscionable, immoral and indefensible. He may clothe himself as a righteous defender of God, faith, and the American way, but he is little more than a hack, offering no solutions or alternate ideas to the “radical agenda” he so despises, unable to differentiate between policy and science, reality and dogmatic, fantastical fundamentalism. He is a sad, tragic joke worthy of the Rubber Dodo. May he display it proudly for all to see, for generations to come.